Evergreen trees make the structure of most gardens, giving permanence to what designers call the ‘bones’ of your garden, while flowering plants come and go through the seasons. Many are used for neutral backgrounds – like screens or hedges – but there are some that are so interesting that they make great specimens that stand out as something different and special. 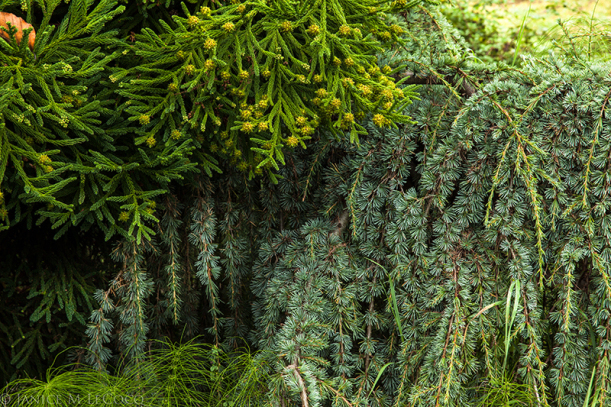 So, what are some hot evergreens that you should consider if you want to add something different and special to your garden? The Japanese sugi, or cryptomeria, is a tall forest evergreen that is found throughout Japan. Its wood is widely used for temples and other important buildings. The wild tree is too large for most gardens, but there are several exotic forms that bring a special something to any garden. Being Japanese, they are especially valuable in Asian-themed gardens, but they work well in other kinds of garden too. This exotic tree is a true ‘must-have’ for the Asian garden. Its exact origins are not known, but it is unique among cryptomerias for having a dramatic and exotic form. No two trees are identical, and each grows into a unique specimen perhaps 10 feet tall and 4 to 5 feet across, that will rear up in your garden like the dragon in its name. The branches swirl and twist in all directions, and the dark foliage that develops in winter only adds to the drama. Despite its exotic appearance this is an easy plant to grow from zone 5 on up, in sun or partial shade, and in most soils. Left to grow naturally this tree will make a unique plant, but if the idea of training a large ‘bonsai’ appeals to you, with some artful pruning and training to enhance its natural form even further, this tree will easily become a unique and spectacular addition to your Asian garden. If a dragon in your garden sounds a bit too fierce, then bring Granny over instead. Or at least her hair, in the form of the very unusual and attractive cryptomeria called by some ‘Granny’s Ringlets’. This small tree can reach 20 feet in time, but begins life in your garden as a mounded bush, only later pushing up a central stem to form a broad pyramid. What makes this tree so special is the form of the needles and branches. The soft, green needles that cover the young stems spiral around them, and this in turn causes the branches themselves to spiral, just like those old-fashioned Shirley Temple ringlets once worn by young girls and older ladies. In the garden the result is a graceful and exotic tree, always in motion, but always still, gradually forming a lovely specimen tree, and ultimately revealing the reddish, peeling bark that identifies the Japanese cryptomeria. Speaking of curls, there is another tree, suited for colder climates, that also has curling needles. Known more correctly as Horstmann’s Silberlocke Korean Fir, and named after the German gardener who discovered it, this tree forms a perfect miniature upright Fir tree, with upturned and curving needles of a brilliant silver blue color, giving a special charm and grace to this hardy tree. It grows well in the cooler areas from zone 4 to 7 and only grows between 6 and 12 feet tall, making it perfect for a small garden. If you love decorated outdoor trees at Christmas, but only have limited space, then this must be your number one choice. Not only is it the perfect conical shape for decorations, but after a few years it will help you out by adding its own. Korean fir produces large, dramatic and upward-turned cones of a gorgeous purple color, which show so well in winter you don’t even need to add decorations to know it is the festive season. Even if you are the dreaded grinch, this is such a great tree you will enjoy it anyway, whatever the season. Let’s finish our tour of the unusual and desirable in evergreens with a spectacular weeping tree that make the perfect accent plant in any garden. Not only is it exotic and dramatic in form, it is also versatile, depending on how you train it, so it will serve multiple purposes in your garden. This tree has sturdy branches clad in stiff green needles, but unlike other spruce, these don’t point upwards, or grow horizontally. Instead, they cascade straight down, forming a beautiful waterfall of green. Left to itself it will form a low mound, and spread outwards across the ground covering as much as 10 feet in all directions. This is a terrific way to cover a bank or slope, or plant it to cascade down a wall, to soften its hard outline. This is a hardy tree and grows from zones 3 to 7, so it adds a terrific touch of the exotic in cold areas where some of the other unusual evergreens discussed here won’t grow. Now if you want to do a little work, it is easy to turn this tumbling pile of branches into an upright weeping tree. Just put in a strong, permanent stake as tall as you need your tree, and tie up one or two of the strongest branches to form a trunk. The other branches will cascade down, creating a lovely elegant and eye-catching specimen in your garden.